Whenever I read these words from Jesus to Nicodemus, I think of the messages I heard as a teenager about what it meant to be a Christian. I was told that there was supposed to be a separation in my life between who I was before and after I “accepted Jesus into my heart.” I believed that my inborn sinful nature was enough to corrupt the goodness that God created within me. I was told that the person I was born to be needed to be overcome and left behind. I obsessed about sin in my teens and early twenties. I rejected the concept of sin a few years later when I deconstructed my faith. But no matter what I believed or didn’t believe about God, I was tormented by guilt and shame about who I was. I think we have misunderstood being “born again” just as much as Nicodemus did. We’ve believed that our rebirth is a complete abandonment of our first birth, that our lives can be divided into old and new, sinful and redeemed. We’ve viewed rebirth as something that happens instantaneously, once and for all. We’ve confused our tendency to hurt ourselves and others as a conscious choice of rebellion that we must outgrow, rather than a wounded part of us that is on a lifelong journey of integration and healing. What if rebirth in Christ isn’t about leaving behind the person we were born to be at all, but about recognizing that we are and always will be full of mixed motives—sinful and sacred, broken and beautiful? The Enneagram is the spiritual tool that has helped me redefine myself in this way. 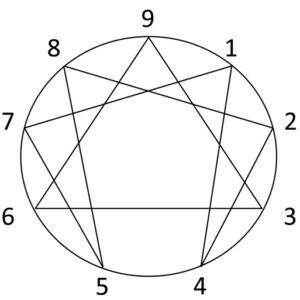 The Enneagram is an ancient personality typing system that may have origins as diverse as Buddhism, early Christianity, and the Sufi traditions of Islam. Each person has a “wing,” a secondary type that shapes their primary type. Wings are typically understood as being drawn from either side of an individual’s primary number. For a One (The Perfectionist), wing options would be Two (the Helper) or Nine (the Peacemaker). I am a One with a Nine wing. Practically this means that the “peacemaking” part of me tempers the critical part of me, helping me to understand and appreciate the different perspectives of others, views which my inner perfectionist might otherwise might perceive as wrong. Each type also has a number they go to when they are stressed and a number that they go to when they are healthy. For example, when stressed, a One takes on the unhealthy qualities of a Four (the Romantic). With the inner critic in over-drive, the unhealthy One becomes resentful of others having fun, sensitive to criticism, and depressed. when feeling secure, a One’s critical voice becomes quieter and they take on the healthy qualities of a Seven (the Enthusiast), becoming more self-accepting, relaxed, and open to spontaneity. These numbered types are more about a person’s motivations than their actions, making it impossible and potentially damaging to “type” someone else. Richard Rohr explains that it takes many people years to even know their own type. If it is the work of a lifetime to know ourselves, how can we really know someone else? For those who are afraid of “being put in a box,” it might be helpful to imagine the types as you would colors. There are an infinite number of unique shades of blue, and yet we perceive each one as blue. While your number may be a helpful tool for understanding yourself, it remains a tool, imperfect and far from from comprehensive. To begin to find your type, I would recommend listening to “The Enneagram” episode of the Liturgist Podcast with Ian Morgan Cron and Suzanne Stabile or reading Cron and Stabile’s book, The Road Back to You. While there are many online assessments that will take less time, I find that taking this slower, more in-depth approach allows you to learn about each type’s motivations, perspectives, and habits, and discern what feels true to the person you know yourself to be. The “road back to you” through the Enneagram starts with a brutally honest personal inventory of the shadow and light within you. You might feel great grief, sadness, and even anger when you learn your number. Perhaps you will finally have a name for the great pain you’ve always felt but never fully acknowledged. You might be devastated to learn that you have within you the thing you’ve always hated. You might sober as your realize how destructive you have been to yourself and other people. You might find great relief when you learn your number because you understand, perhaps for the first time in your life, that you were meant to be who you are, with your unique strengths, weaknesses, and everything in-between. You might feel more connected to others, knowing that within your number there were, are, and always will be other people who see the world the way that you do. Though it comes though great pain, the rebirth possible through the lens of the Enneagram is good news. In this holistic system of grace our “good” and “bad” attributes are not understood as competing forces within us, but as parts of a spectrum. A balance of light and darkness, yin and yang in which our great gift and our great downfall are two sides of the same quality. What threatens to destroy us also makes us successful. What torments us also brings us life and gives life to the world. With the knowledge of your number’s motivations, struggles, and path to health, your life can begin to transform from a quest to fix yourself to a journey toward harnessing the inherent goodness in every part of who you are. Because of the pain caused by my inner critic (type One), it is natural for me to try to shut it up, but when I do this it only comes out more violently. I have come to realize that this angry voice is my voice, the voice of a scared little boy who learned to be as perfect as possible, seeing and analyzing and fixing his shortcomings before anyone else could. It was his way of surviving. I have learned to speak gently to him. To thank him for protecting me. But I also know that what Jesus said to Nicodemus is true for me: It is time for the little boy to grow up, to find a new identity, to have his brokenness transformed into maturity. This critical voice doesn’t need to stop speaking, it needs to be transformed. After all, another name for the One is “Reformer.” Mahatma Gandhi, Nelson Mandela, and Jimmy Carter are Ones. I am learning to be aware of my drive for perfection, at times detaching from it and at times harnessing it to move toward my own health and wholeness hoping that my struggle will enable me to work for the health and wholeness of others. May we all be born again. 1 — May the perfectionist make peace with their imperfections and work for change in the world. 2 — May the helper know that they do not need to serve others to be loved. 3 — May the performer feel acceptance in their falling and failing. 4 — May the romantic know that they belong. 5 — May the investigator embrace their life and its emotions without knowing all the answers. 7 — May the enthusiast stop chasing the next high and have the courage to confront the hard things in life. 8 — May the overcomer walk defenseless toward themselves and others. 9 — May the peacemaker hear and speak their own voice, knowing that the world needs to hear it. May all of us be born again so that we might see the kingdom of God and live more fully into the joy that is found when we say “yes” to our true selves. Drew Herring is the Pastor of Adult Education and Outreach at Broadway Baptist Church in Fort Worth, TX. You can find his writing on spirituality, community, and the adoption journey at his blog “Unfinished Thoughts”. You’re right! Thank you catching that.